Surrounded by mountains, Bandung is a comfortable city to live in with a cool climate throughout the year. The city also has the characteristics of an educational city with many universities, and this makes it a particularly highly favored city in terms of both education and sightseeing. In the past, the city was widely known as "Paris van Java" for its beauty. The Bandung Institute of Technology (ITB) is located 180 km southwest of Jakarta in the West Java provincial capital of Bandung. The government of the Netherlands, the colonial master of Indonesia in the early 20th century, required many engineers and founded the ITB in 1920 (then, De Technical Hoogeschool [TH]). At the time, there was only one department (de Faculteit van Technische Wetenschap) and one faculty (de afdeling der Weg en Waterbouw). 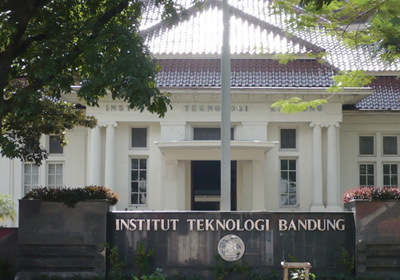 The university was renamed the ITB in 1959 and became the first technical college in Indonesia. In 2000, it was approved as an incorporated institution by Act No. 155 enforced by the Indonesian government. This allowed it to develop more than ever before as a university that promotes research. Today, it sets four objectives: excellent education, intellectual contribution, industrial cooperation and community activities. The ITB promotes the enhancement of technical capacity and sustainable development in the Pacific area of Asia through higher education, research and social activities. It focuses on challenges that share the spirit of this GCOE program, such as internationalization, networking, and the development of the most advanced technologies, in addition to global challenges that reflect the socioeconomic situation of Indonesia. Joint research projects with the ITB consist of research on human security related to energy in Jakarta and surrounding areas, including the effects of global warming, Carbon Capture and Storage (CCS) technologies, disaster prevention, and data collection related to these themes. Indonesia is a disaster prone country where three tectonic plates collide, and an archipelagic country with the second longest coastline in the world. Although rich in natural resources, it has problems like volcanoes and earthquakes. Research on natural resources and disasters, therefore, is very important in Indonesia. Human security problems related to energy are especially important in cities with an excessive population concentration, such as the capital Jakarta. The problem of increased carbon dioxide emissions is also ever-more pronounced in Jakarta. Studies on the rise in sea level and the increased occurrence of natural disasters due to climate change, as well as on ways of coping with these, are important research issues.